Warwickshire Farm Holidays: Find cheap holiday accommodation in Warwickshire with our holiday rentals. We have romantic English country cottages and farmhouse B&Bs for great holiday lets and accommodation that is far cheaper than hotels. By renting a self-catering farm cottage you have spacious accommodation set in peaceful and idyllic surroundings. The children will love the freedom of wide open spaces to explore and the farm animals to pet which makes staying on a farm a stress-free, cheap, family holiday. This is a beautiful shire and, in my opinion, has one of the best-preserved castles in the country. Warwickshire castle is fondly remembered by my adult children when they visited the castle many summers ago and witnessed jousting competitions, the rat catcher with his prize of dead rats hanging from the top of his pole and listening to the strange haunting melodies coming from the Medieval tents as costumed players played on instruments seldom heard. This is definitely a must for the kids, and it would be a shame to visit the castle when these activities were not scheduled as it really makes the past come alive. Warwickshire farm holidays will take you to Warwick town, a fascinating place that has an excellent museum. Not to be missed too is one of the most interesting building's of Warwick to survive the great fire in 1694; Lord Leycester Hospital. This historic group of buildings date from the 12th and 16th centuries. 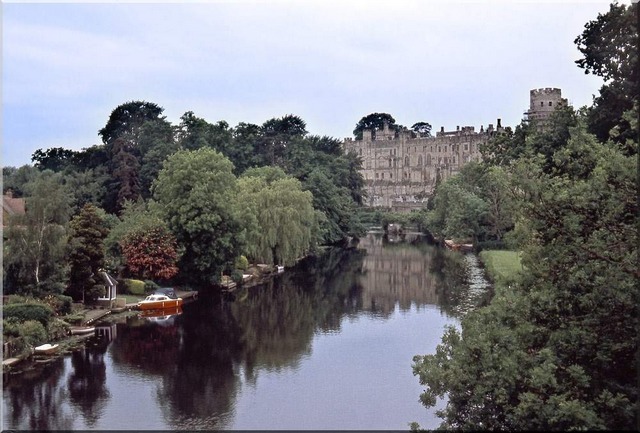 Not far from the town of Warwick is Stradford-upon-Avon, a town that really needs no introduction being famous for being the place where William Shakespeare was born and lived. His house still stands and is visited by thousands of visitors every year. Stradford is a pretty town with the river Avon coursing lazily through. Feed the swans or hire a boat for a couple of hours or a canal boat for a longer trip, to do some exploring of your own. The experience is very relaxing and it takes you to some lovely parts of the countryside. Warwickshire farm holidays will also take you to the quaint thatched home of Anne Hathaway, Shakespeare's wife, where the couple took to courting. It is a little way out, but a picture-postcard cottage awaits you that is well worth the trip. Warwickshire farm holidays offer plenty of cheap accommodation of all types; self-catering farmhouse or country cottages, or country farmhouse B&Bs where you can always count on a delicious full English breakfast. You can just smell those homemade sausages, thick, farm bacon rashers and free-range eggs. Come to Warwickshire for your next farm holiday. I promise you, you won't be disappointed. Your romantic country cottage is waiting just for you. If you have a farm in Warwickshire that you would like to showcase visit our Farm Forum. You can upload a picture and brag a little. We don't mind! Share a farming story, tell us about your best or worst farm holiday and lots more. There are other individual farming discussion boards to contribute to through this forum, as well as a Craft & Recipes Forum where you can share your favorite recipes and also get some crafting ideas for various arts & crafts.